From 1973-75 the Impulse! 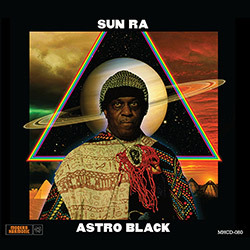 label released a few Sun Ra albums, the first of which was "Astro Black" with a large Arkestra-like ensemble of well-known collaborators making up the band as they perform the title track, "Discipline, "Hidden Spheres" and "Cosmo-Fire", reissued as a 2018 Record Store Day releases in its first proper reissue. 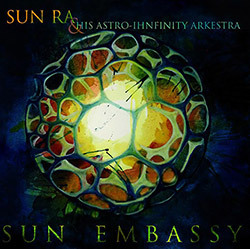 In 1973 Sun Ra went into the studio for Impulse! 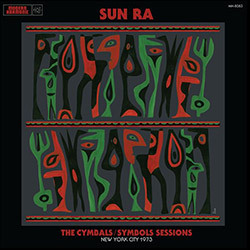 to record "Cymbals" with the octet of Danny Davis, John Gilmore, Elmoe Omoe, Ronnie Boykins, Derek Morris, and Akh Tal Ebah; though 2 LP's worth of material were recorded, the album was never released until now, in a remastered edition bringing listeners this much-anticipated album of synth-heavy, Arkestra-oriented 'Ra.